In 1963, AM radio station 800 CKLW in Windsor, Ontario became a full-time rock, pop, and R&B hit machine, servicing large swaths of Canada and—just across the border—the Detroit metro area. Within four years, CKLW was the top station in its market, and had built a cult following among those in the eastern half of the U.S. who could pick up the broadcasts on clear nights. The programmers mastered the “boss radio” format: an action-packed hourly block that cycled through 18 songs, a smattering of zippy jingles, rapid-fire DJ patter, and two pulpy newscasts every 60 minutes. That relentless momentum kept young people throughout the “Big 8" listening area locked into the station, afraid to miss an important dispatch from the front lines of the youth rebellion. 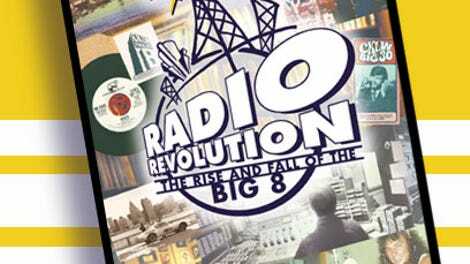 Michael McNamara’s documentary Radio Revolution: The Rise And Fall Of The Big 8 (available exclusively at radiorevolutiondvd.com) covers nearly every aspect of the station’s blaze of glory, from the technological wizardry behind its amplified “boom thump” signal to the ways CKLW furthered the careers of artists like Alice Cooper, The Guess Who, and Tony Orlando. McNamara interviews jocks, fans, and musicians, and edits their reminiscences into a kaleidoscopic, poppy portrait of a vanished cultural force. The documentary doesn’t skimp on CKLW’s fall—prompted largely by the Canadian government’s mandate that they dedicate 30 percent of programming to “Canadian content”—but it’s more concerned with capturing the enthusiasm and adrenaline that accompanied the station’s rise. Over 70 minutes, McNamara covers his beat well, giving a fair amount of space to sub-topics that could support a documentary all on their own, like CKLW’s controversial “20/20" news segments, which specialized in lurid eyewitness accounts of Detroit street crime (often totted up on “The Motor City Murder Meter”), or the hit-savvy ear of secretary-turned-programmer Rosalie Trombley, who told rock stars like Elton John and Kiss which songs to release as singles. Radio Revolution’s rosy vision of the last great radio era is so seductive that it may make viewers spin madly through their AM radio dials, chasing ghosts. Key features: Bonus interviews and deleted segments delve deeper into the pressure on CKLW’s DJs, and what the station’s mix of “white” and “black” music meant to rock critic Dave Marsh, among others.